NETWORK FINALS: SCORPION gained 0.1 in final numbers. TAKEN and WHEN WE RISE stayed at their preliminary numbers, although it’s worth noting that TAKEN fell from 2.1 to 1.4 in the course of its hour. CABLE HIGHLIGHTS: The usual suspects were at the top of Monday cable. On VH1, LOVE & HIP-HOP gained a tenth to 1.37, THE BREAKS dropped 0.06 to 0.56, and MARTHA & SNOOP’S POTLUCK DINNER PARTY ticked down to 0.47. USA’s WWE telecast was at 1.14/1.08/1.02, compared to last week’s 1.17/1.16/1.14. On Discovery, FAST N LOUD jumped 0.15 to 0.95, and DIESEL BROTHERS was up 0.02 to 0.74. MTV’s TEEN MOM rose 0.07 to 0.89, and the AFTER-SHOW was up 0.05 to 0.55. On Bravo, VANDERPUMP RULES gained 0.03 to 0.64, and SUMMER HOUSE was up 0.04 to 0.32. TNT’s NBA doubleheader featured Indiana vs. Houston at 0.49, and Cleveland vs. Milwaukee at 0.42. A&E’s BATES MOTEL fell 0.08 to 0.43, with lead-ins COLD CASE FILES at 0.25 and THE FIRST 48 at 0.24. 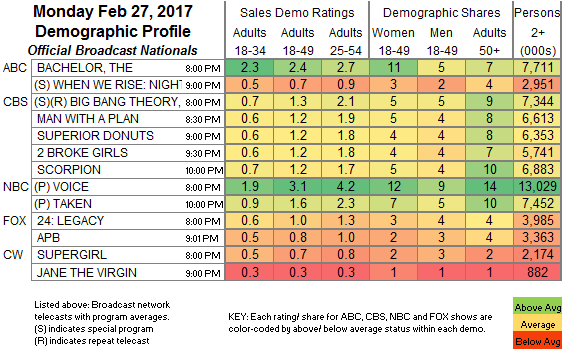 TLC’s COUNTING ON climbed 0.03 to 0.36. 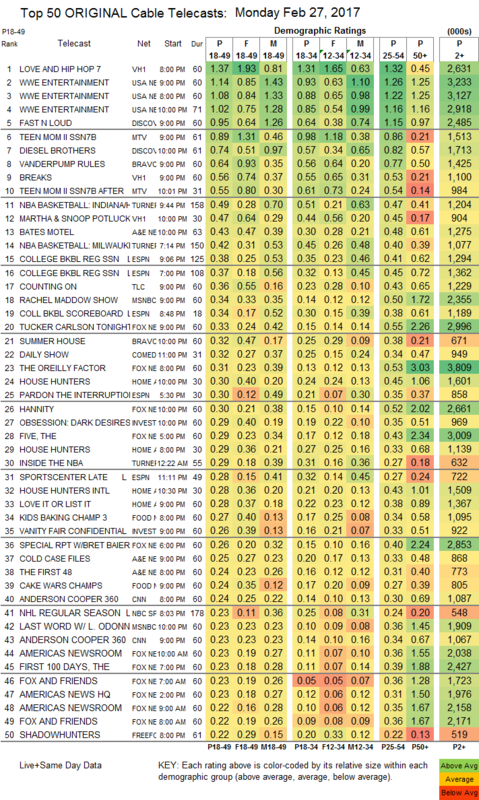 On HGTV, HOUSE HUNTERS was at 0.30/0.29, compared to last week’s 0.44/0.37, HOUSE HUNTERS INTL fell 0.15 to 0.28, and LOVE IT OR LIST IT was down 0.11 to 0.28. Food Network’s KIDS BAKING CHAMPIONSHIP lost 0.15 to 0.27, and CAKE WARS was at 0.24. On Freeform, SHADOWHUNTERS fell 0.08 to 0.22, and the season finale of BEYOND dropped 0.04 to 0.09 (somehow, Season 2 is on the way). AMC’s HUMANS dropped 0.05 to 0.12.